When we arrive in Monemvasia, our bus driver decides tonight is a good night for octopus and heads down to the pier to catch one for the hotel chef. Vagelis has been driving my family and 19 college students all through Greece for the past two weeks for a class my parents are teaching. We stand by the bus as he wades knee-deep into the clear water with his fishing spear and waits between a cluster of rocks. Suddenly, he strikes into the cold currents and pulls his weapon back, a wriggling sea creature tangled at the end of the spear. We watch as Vagelis quickly dispatches the octopus with a slice to the neck, and brings dinner back to shore. And then, in a startling and violently mesmerizing act, he begins swinging the tentacles against the side of the pier—like a bullwhip—until the octopus is absolutely foaming from all pores. He walks back to the hotel, the limp creature dangling from one hand. The Greek love affair with the octopus spans millennia, and off the coast of the Mediterranean, octopus fishermen have carried on the techniques and traditions of their forefathers. As a child, not only did I witness Vagelis fishing, but heard stories of my own papou and great-uncle standing on the shoreline holding their fishing spears—their psarontoufeko—ready to head to sea and catch dinner for the following evening. It was a primeval sight. They would be out all night, shining flashlights between the rocks, searching for the slightest flick of a tentacle. Come morning, octopuses would drape the balcony—drying in the fierce Greek sun. Though Vagelis fished early in the day, most Greek fishermen opt to head out late at night to catch their bounty. Octopuses are easier to catch when stunned by a beam of bright light in the darkness. During the day, they are more alert and will slip away when even slightly alarmed. 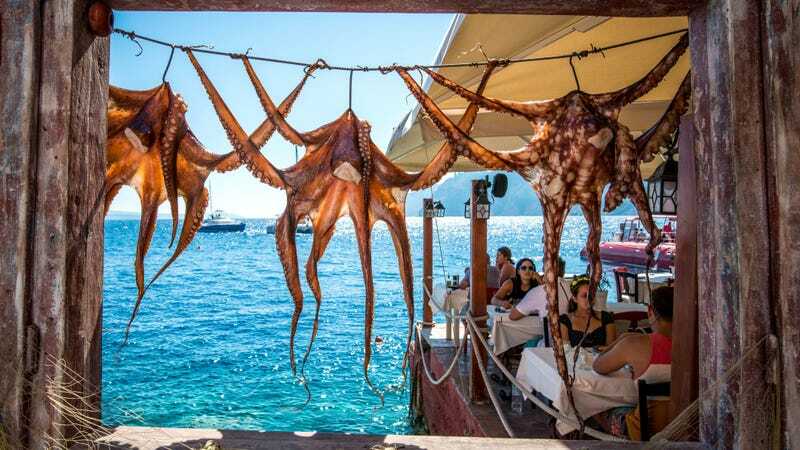 The fishermen will often go sell the octopus in the early morning fresh fish markets, or bring the octopus straight to the taverna for dinner that night. Before it is sold to the chef, the octopus must be tenderized, or beaten to break down the meat. Here is where tradition and technique converge. The creature is all muscle, tightly wound and incredibly tough. Most fishermen will kill the octopus with a cut to its neck, scoop out the entrails, and begin to smack it against the shoreline rocks. They would swing the creature over their heads in a large circle and thwap! My papou and great-uncle would loop their fingers into the head for a better grip, and then focus on hitting the thicker limbs and shoulders. Once tenderized and brought to the taverna, the octopus must be hung to dry. It’s not an unusual sight to see a number of long-hanging mollusks dangling across a length of rope or wooden beam, absorbing the sun for the entire day. This process not eliminates any remaining water, but the residual salt from the seawater helps preserves the octopus and adds a natural seasoning to it. For the unfortunate restaurants that don’t operate along the Greek coast, one must improvise. At some restaurants, an entire washing machine is devoted to tenderizing octopus. For others, such as Tarpon Springs’ Hellas, boiling is the preferred method of preparation. Of course, with washing machine or boiling, some control is lost in using modern techniques. I do not remember the taste of the octopus grilled that night in Monemvasia nor can I say I prefer the slight chew of a sun-dried dish compared to a tender boil. Yet, I see Vagelis snapping that octopus out of the water again and again. I see my papou with his long fishing pole and sharp spear standing near his brother’s boat ready to bring home whatever he can catch. The greater loss, at least for me, is tradition—the thwap against the rocks, the smell and taste of the sea, the Greek air, the revelry and celebration of grilled octopus. Nostalgia, too, becomes an essential flavor.